A high-ranking Cambodian delegation led by its Prime Minister Samdech Akka Moha Sena Padei Techo Hun Sen departed here this morning for Japan to attend the Third United Nations World Conference on Disaster Risk Reduction to be held from Mar. 14 to 18, 2015 in Sendai. 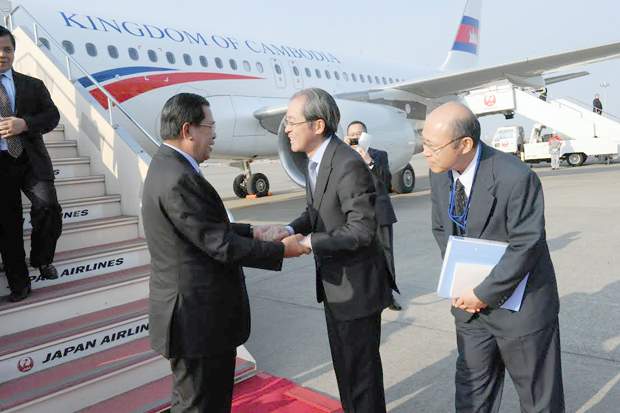 The delegation was seen off at Phnom Penh International Airport by Deputy Prime Minister and Minister of Interior H.E. Sar Kheng and many other senior government official as well as Japanese Ambassador to Cambodia H.E. Kumamaru Yuji. Samdech Techo Hun Sen will deliver a speech related to disaster risk reduction and other concerns in the context of climate change, said H.E. Sry Thamrong, Minister attached to Prime Minister told reporters at the airport before the departure of the Cambodian delegation. According to the Ministry of Foreign Affairs and International Cooperation’s press release made public recently, the upcoming conference will review the progress of the “Hyogo Framework for Action 2005-2015: Building the Resilience of Nations and Communities to Disasters” and consider its successor—a post-2015 framework for disaster risk reduction. On the sidelines of the conference, it added, Samdech Techo Hun Sen will be received in Royal Audience by His Majesty the Emperor Akihito and Her Majesty the Empress Michiko of Japan in Sendai and hold a bilateral talk with H.E. Shinzo Abe. 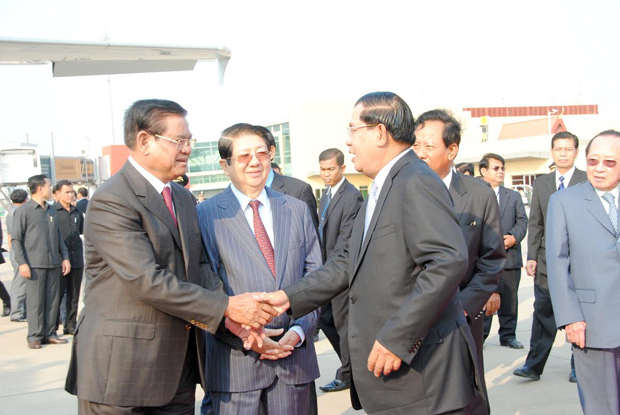 Samdech Techo Hun Sen was accompanied by H.E. Nhim Vanda, Senior Minister in charge of Special Mission and First Vice President of the National Committee for Disaster Management (NCDM), H.E. Ly Thuch, Senior Minister in charge of Special Mission and Second Vice President of the NCDM, and other members of the Royal Government of Cambodia.